I woke early. The sun streamed into my window and brightened the entire room. The sun, I hadn’t really seen it since I left the US. The sky was a beautiful light blue and white fluffy clouds rolled lazily by. It was a good morning. My To Do List flooded my mind. I needed to get the internet fixed. I needed the university to verify my passport. I needed a mobile phone and I needed a bank account. I needed to exchange money. I needed to find the archaeology building. I needed breakfast. 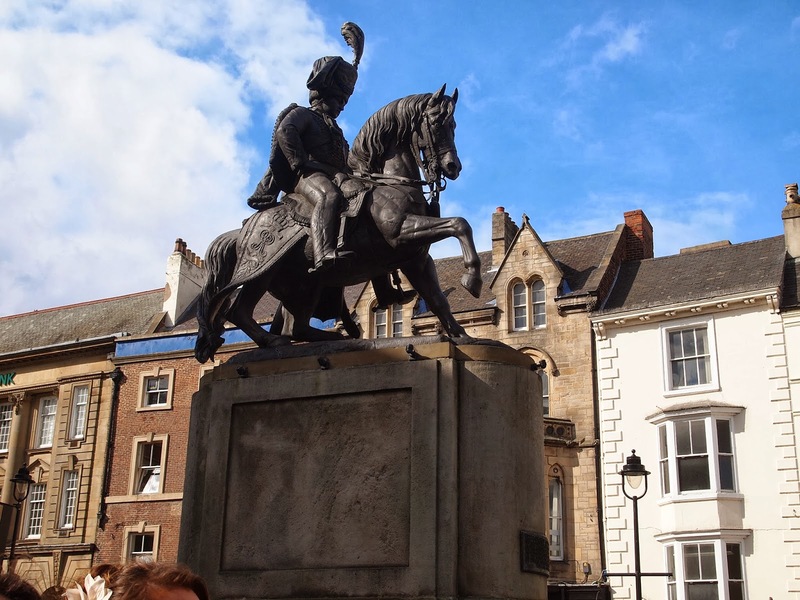 There was also a walking tour of Durham which left from Howlands Farm and I thought if I could make it, it might be a nice introduction to the city. I slowly, exhaustedly rose from my bed and went to take a shower. Now as any human in Western civilization knows, the hardest part of living somewhere new is figuring out how the shower works. It took me a good five minutes to produce hot water out of the shower head. Some of my tension began to melt away as I stood allowing the water to rush over me. I dressed, brushed my teeth, and crept into the kitchen. I was terrified of waking my flatmates. It was still very early in the morning. I silently made a bagel with cream cheese and wolfed it down. Back in my room I began packing up my large, red laptop bag. I put my laptop and power cord in, then my red binder of important documents. I packed up my camera in case I wanted to take pictures. I packed some pens, my notebook, and my archaeology binder. My bag must have weighed close to ten pounds when I had finished jamming things into it. I set off. I decided I wanted to walk. The bus was £2 to ride all day, but I still didn’t have any English money. The walk was long and by the time I reached town I felt the full weight of my bag. My back rebelled against the burden I had set for it. I can’t remember having pain like that before. I entered Market Square and everything was still shut and I realized I wouldn’t be able to exchange my money. I went to an ATM and decided that the fee was a small price to pay for having the correct currency. 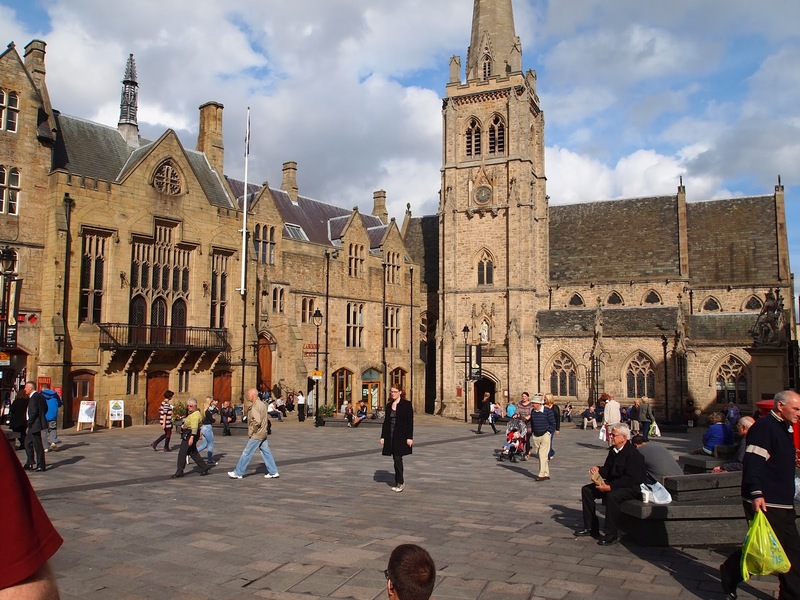 Market Square in the daylight was just as magical as at night. There were several vans parked in the square dropping off deliveries. A few people were wandering around. The early sunlight created a pink haze around everything. It was beautiful. Off I went to the Palatine Center. If I couldn’t get my computer fixed then I could head down to Howlands Farm and perhaps pick up my bank letters and then I’d have everything I needed to open an account. 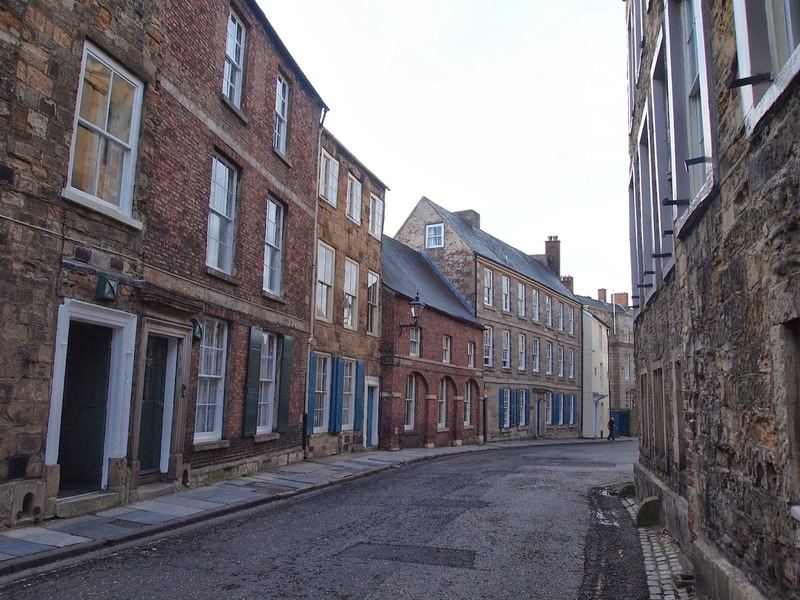 I wandered out of Market Square and down a narrow side street that I thought might take me south. I had grabbed a map out of my welcome pack and was using it to navigate the city. The buildings were so close together and each was so different from the next. It reminded me of Diagon Alley from Harry Potter. All of a sudden the Cathedral loomed up upon me. I looked at my American cellphone and saw that I had plenty of time to wander before they would take the first appointment. I turned onto Palace Green and stopped dead in my tracks. 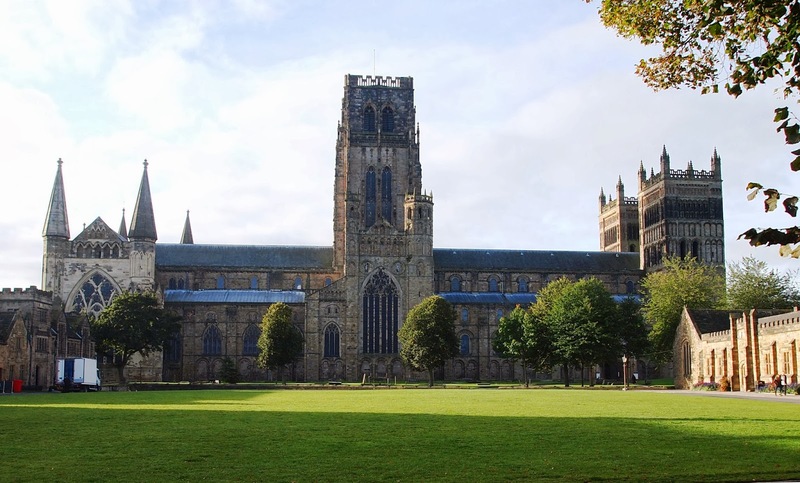 I had graduated in a grand cathedral seven years ago, but the sight that met my eyes that morning assured me I had seen nothing as grand and imposing as Durham Cathedral. Perhaps it was also the knowledge of just how old it was; nearly a thousand years old. A thousand years old. There was nothing back in the US I could think of to compare it with. I had to go in. Enormous vaulted ceilings, rounded arch ways, carved rounded columns, the ornately carved fount, and the organ. Oh the organ! It was truly incredible. The stonework echoed with my footsteps and I tried desperately to be silent. I am by no means a religious person, but the Cathedral was awesome; awesome in the true meaning of the word. 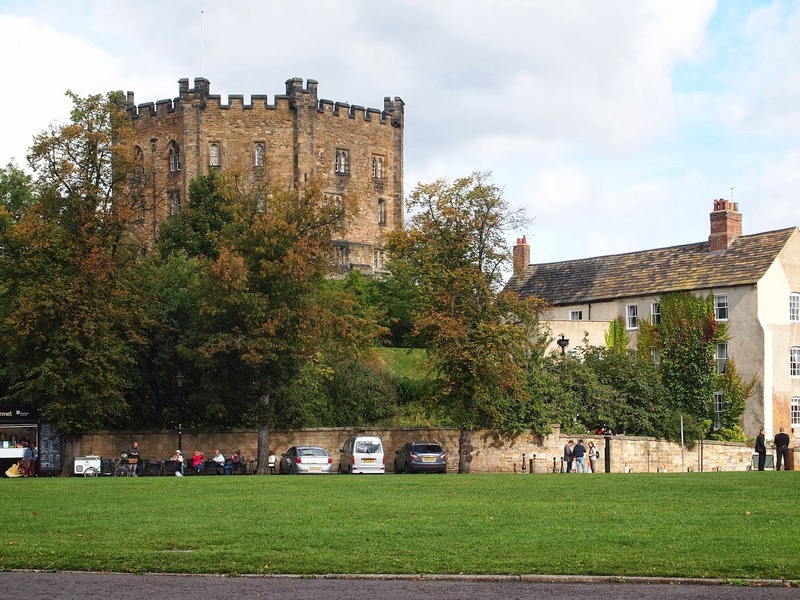 As I wandered back out, I looked across the Palace Green and saw the Castle. I couldn’t believe where I was. I had seen all of this in pictures so many times but now I was standing here. I began to feel better. More optimistic. More settled. By the time I made it to the Palatine Center it was nearly nine forty. I could grab the ten o’clock appointment and have internet access by eleven. I went into the IT department again and asked for the earliest they had. Someone had just grabbed the ten o’clock so I took the appointment for twenty past. That gave me nearly forty minutes with which to do…..what? 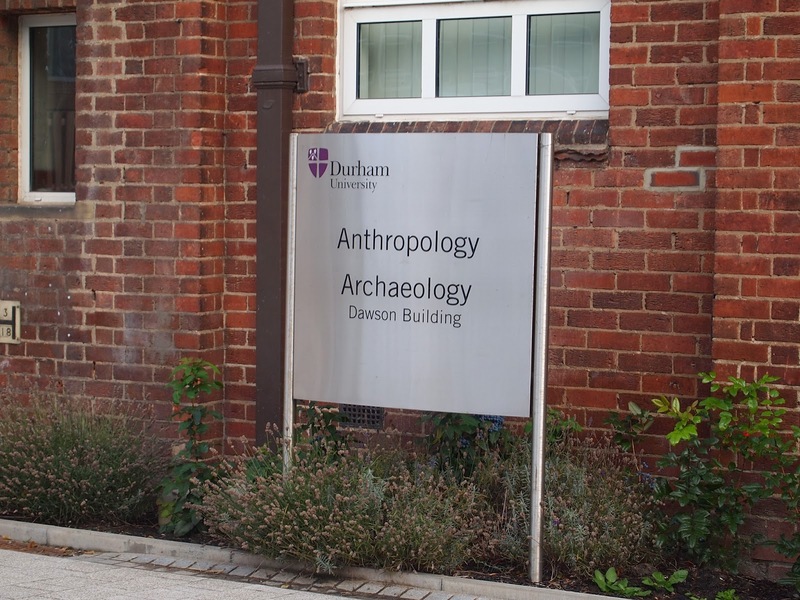 I knew the archaeology building was very close by; perhaps I could go and find that. I set out of the Palatine Center and wandered onto the Science Site. I was so glad my lectures would be here. While I have never claimed to have a scientific brain, I admire scientists greatly. They have the power to unlock the mysteries of the universe or the mysteries of the human mind. Perhaps the one is the key to the other. 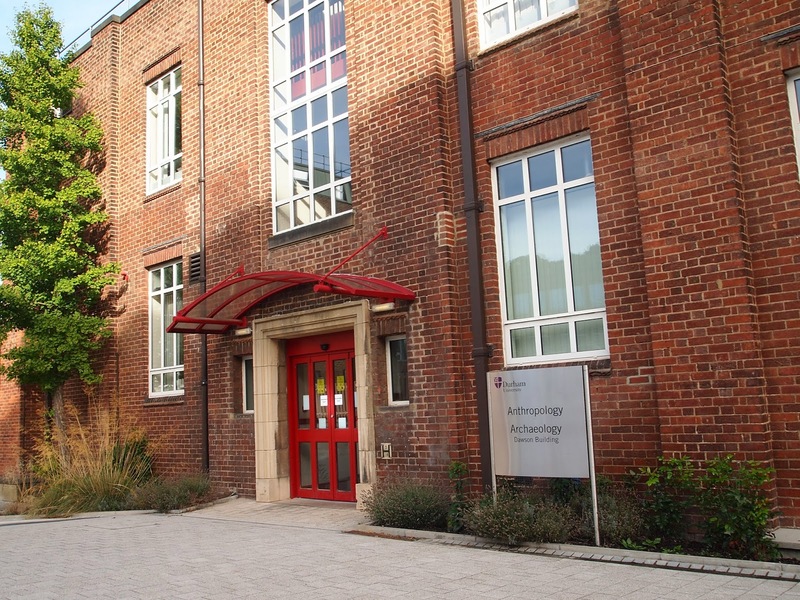 The first building I came across was the Dawson Building where the Archaeology Department was housed. No harm in maybe finding the postgraduate secretary and introducing myself, I thought. I wanted to get my bearings as well so I would know where to go on Monday for induction. A long white hall greeted me with framed photographs of different native peoples and places. I came to a red staircase and a sign pointed me to the second level. Up I went. There was a set of glass doors in the left corner and I went through them. I wandered the hallways looking at the postings, feeling suddenly at home. I was where I was supposed to be. This was my place. Unfortunately, I didn’t know my place very well yet. I ended up walking around in a complete square and ended up back at the double glass doors. I went around again, this time looking at the name plates on the doors. I still didn’t find the Postgraduate Secretary, Helen Wood’s door. I saw a tall bearded man emerge from his office. “Excuse me, I’m sorry. Could you tell me where I might find Helen Wood?” I asked. I thanked him and he went on his way. Out of curiosity I looked on his door to find out whose debt I was in. Chris Caple. I chuckled to myself. He was in charge of the Conservation program. I had read two of his books over the past year and he was one of the lecturers I was most looking forward to meeting. I secretly hoped he would not forever think of me as the Lost Girl. I found Helen’s office. She was about my height, with shoulder length blonde hair. I introduced myself to her and asked about induction. She was clearly at the height of her busiest time. I could only imagine the number of new students she had to deal with and the preparations that were underway for our induction on Monday. Despite this, she was nice enough to give me a minute or two to ask where I needed to be on Monday and to say how glad I was to meet her in person. She had been my only contact with the department for an entire year. If I had any questions, she was usually the first one I emailed about anything related to the university. I don’t know what I would have done had she not been so helpful and prompt with her responses to my myriad of questions. It was time to head back to the Palatine Center. I wandered into a small conference room where four Durham IT guys were seated around a table helping students who were all having similar problems as I was. The man in the far corner waved me over. I sat down and explained the situation. “Here’s the patient,” I said pulling my laptop from my heavy bag. He chuckled. “I’ve tried to download the suggested software but my computer keeps insisting it isn’t needed,” I began. He seemed relieved. I guess most students had no idea what the root cause of their IT problems were. I had been battling with my computer since the previous afternoon and had a fairly good idea that the problem was either Windows 8 did not want the suggested spyware software or that Webroot was throwing a tantrum at being replaced. Off he went on my laptop. Opening windows and double clicking icons. I was in a much more cheery mood knowing it was a quick, easy fix. “Alright, now we just activate this and it will take a minute. The longest minute of your life,” he joked. “You don’t look old enough to remember that,” he said. The internet! There it was in all its glory. I thanked my savior profusely and packed my computer back up. I left the Palatine Center and the Science Site in the highest spirits. Maybe things wouldn’t be so bad here after all. It was only 10:30 when I began walking up to Howlands Farm. The walking tour was scheduled for 11:00. I would most likely make it, but if not I knew I could at least use the wireless connection at Fisher House. Fisher House was home to the Ustinov pub and café. I could also grab a quick lunch there and maybe break the twenty I had gotten from the ATM. Howlands was up a hill. Everything seemed to be uphill in this city. My bag weighed me down and I was bent almost double. I finally reached Fisher House where I unpacked my laptop and finally could let everyone know I was safe. I emailed my parents first and then posted my first Facebook status from England and began catching up on everyone’s news. It was nearing 11:00, I glanced behind me to see a large group forming in the corner. I knew this had to be the walking tour. I shrugged. I had done what I set out to do that morning. I might as well take a tour of Durham. I was answering an email when I glanced around again and spotted someone I thought looked familiar. I turned back to my computer and opened up a set of emails I had been exchanging with a girl I would be working with on one of the programming committees in college. She looked like the girl in the profile picture. I turned around again. She REALLY looked like the girl in the profile picture. But what if she wasn’t? She sort of had her back to me. I packed up my computer, all the while looking over at her. I was now probably looking very creepy to anyone who had been looking at me for the past five minutes. I stood up and sidled over to where she was standing. She was talking with another woman with short brown hair. I was hoping to overhear a name or something that would indicate that this was the same girl. It was so noisy I couldn’t hear anything. I looked around. There was nothing for it. I tapped her on her shoulder. “Excuse me, are you Charlotte?” I asked hoping that it was and that I wouldn’t look like some Creepy McCreeper. “I’m Jen. We’re going to be working on the Café des Arts together,” I said smiling. She began to smile, too. We sort of hugged, having been in contact for well over a month, a handshake didn’t seem the appropriate greeting. She introduced me to the woman she had been speaking with as Trish from Virginia. I smiled and shook her hand. It was so good to talk to people and it turned out that we were all in the same department. 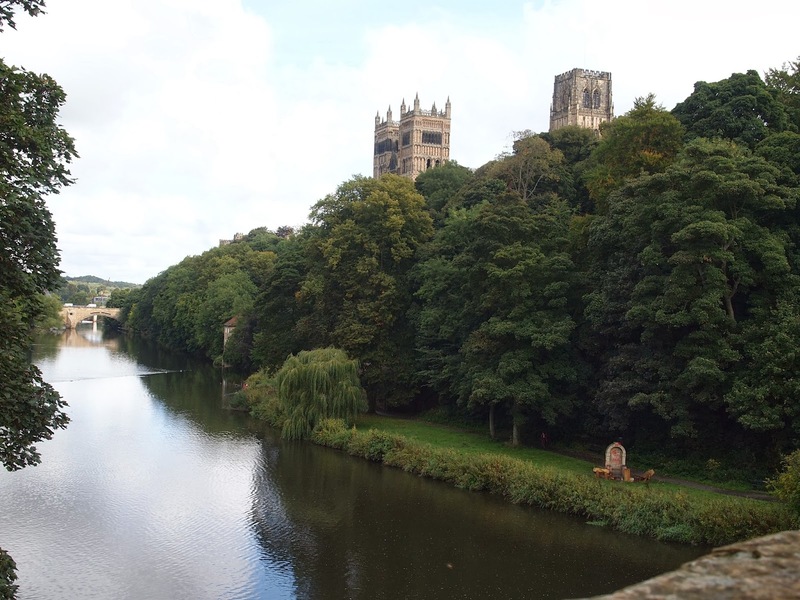 We talked about our adventures in arriving in Durham, some of the troubles we had had and what we were all planning for the week ahead. The tour set out. Our guide was a third year PhD student with ginger colored hair. In some ways, I was reminded of one of the Weasley twins. He had already handed in his dissertation and was waiting to hear back. Probably the hardest thing about a dissertation is the waiting to know what your fate will be. Or maybe the hardest thing is to write it. I hope I don’t need to find out. I don’t think I will ever know why we all decided to go on the walking tour that day or how we ended up on the same tour together since they had split the larger group into two. I don’t believe in fate. Perhaps it was simply the most enormous coincidence of them all. The four of us would become the fastest friends. After the tour we went on to have a late lunch together at a fish and chip shop in town. Then we went to the mobile phone shop and my new friends helped me and Trish pick out English mobile phones. They were the first ones I put into my contact list. The rest of the week would be spent together and our little group kept growing. We met two more Sophies that night at the President’s Reception back at Howlands. We also met Jess from New Zealand, Elena from Italy, Ingrid from Norway, Sam from all over, and so many more. For some odd reason we continued to meet people from the Archeology Department. Archaeologists were everywhere! I can’t begin to tell you, reader, how happy I am I plucked up the courage to talk to Charlotte that day. I can’t tell you how glad I am I made it to that walking tour.